The plugin enables you to easily display recent posts. 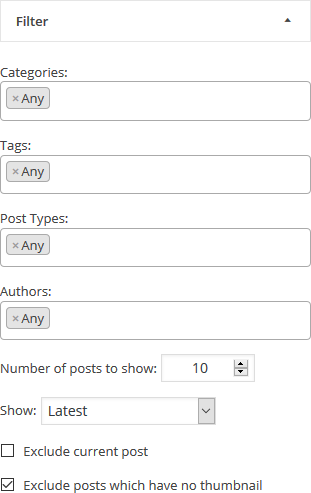 You can control the post types and taxonomies from which the list of posts is extracted, in addition to the number of posts and sort order. It can be inserted as a widget in a sidebar or as a shortcode in the content. This is the classical WordPress widget layout, all post items are listed vertically top to bottom. It is also possible to have the post items to slide in a “news ticker” style, were a mouse hover stops the automatic sliding. All post items are displayed from left to right (right to left in properly configured RTL themes). It is not designed to be responsive and when the available space is not wide enough to display all data, a scrolbar will be displayed, or the right most items hidden. It is possible to have the post items to slide in a “news ticker” style, were a mouse hover stops the automatic sliding. This layout can be used to achieve a grid effect. The items are displayed in a table, starting in the top left cell and ending in the lower right. A table can be made responsive to a point if you don’t mind varying amount of space between the columns. This layout generates a grid dynamically based on a configured grid. Post items are organized to best fit the available width. It is responsive to browser window width, and regenerates when window width is changed. Each post item is roughly composed of three parts – thumbnail, title and excerpt with each part have its dedicated settings that control the way it is displayed. The thumbnail can be used as a background (cover) to the textual parts, placed above them, placed below the title or aligned to any side. You can have post items displayed in two different ways, refereed to as “alterations”, and set a pattern to decide when does each alteration is being displayed. An easy usage example, you can have the thumbnail of odd post items to be aligned to the left, while on even ones it is aligned to the right. By using the [termposts] shortcode you can insert a unique widget into any place in a content. The shortcode has the same functionality and configuration options as a “normal” widget. Once the shortcode is in the content you need to get to the customizer for the post. The easiest way to do that is to go into preview from the post editing screen and click the “Customize” menu on the “admin bar”. In the costumizer you will find the “Category Posts Shortcode” Section and entering it will show you a form with which you can configure the displaye of the shortcode. There are many aspects to the widget and shortcode you can control including which posts will be displayed in it and some styling to the way they are displayed. Since there are many options to control, in order to ease keep the admin area in a reasonable height we have divided the options into “panels” in which related options are being grouped together. You can open (expose the options) and close (hide them) by clicking the title of the panel. Except for the visual effects, changing the options behaves exactly like it behaves in any other wordpress widget, both in the widgets admin screen and in the costumizer. Here you can find options to control what is displayed above the widget, also known as its title. 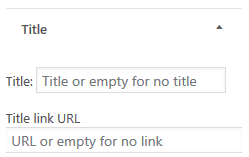 You can either not display a title at all, display some simple text, or display a link to the relevant category page. Title: The text that is being displayed as the title, If empty, the title will not be displayed at all. Note: If you add the widget as shortcode in the content you can write a widget title also above the added shortcode. Here you can control which posts will be displayed in the widget. You can control their number and the sort criteria by which they are selected and displayed. Tags, categories, and other terms: For each public taxonomy which is defined in the site (categories and tags for blog style site, product categories and attributes if you have woocommerce, etc) a selection/menu box is displayed in which you can select posts from which selected terms of those taxonomies (i.e. specific categories, specific tgs etc) will be displayed. If you do not care about filtering by a specific taxonomy, you can set it to “Any“. This will cause that taxonomy to be ignored for filtering, and posts that are associated with any terms in it, or not associated at all, will be displayed based only on the other filtering criteria. usage: Clicking on the input area will open a drop down menu from which you can select the terms to filter by. You can also add them by writing their name and the drop down will adjust dynamically to show relevant matching terms. To remove a term, just click on the small”x” to the left of the term name. Post Types: For each public “post type” which is defined in the site (posts and pages on a simple site, products if you have woocommerce, etc) a selection/menu box is displayed in which you can select posts from which post type will be displayed. Unlike the term filtering, to be displayed a post has to belong to any of the selected post types. Posts which do not belong to any of them will not be displayed. If you do not care about filtering by post types, you can set it to “Any“. usage: Clicking on the input area will open a drop down menu from which you can select the post types to filter by. You can also add them by writing their name and the drop down will adjust dynamically to show relevant matching post types. To remove a post type, just click on the small”x” to the left of the post type name. Authors: On a site with many authors a selection/menu box is displayed in which you can select posts from which author will be displayed. This is not being displayed at all if there is only one author at the site. Unlike the term filtering, to be displayed a post has to belong to any of the selected authors. Posts which do not belong to any of them will not be displayed. If you do not care about filtering by authors, you can set it to “Any“. usage: Clicking on the input area will open a drop down menu from which you can select the author (by his display name) to filter by. You can also add them by writing their name and the drop down will adjust dynamically to show relevant matching authors. To remove an author, just click on the small”x” to the left of the author name. Number of posts to show: The number of posts that will be displayed in the widget. Show: The sort criteria used to select which posts out of all the posts associated with the category are actually going to be displayed. It also controls the display order. Random: No sort at all, posts are randomly picked to be displayed on every new page load. Note: Sometimes this option is useful which is why we provide it, but it is more resource demanding, and when using any type of page caching, you will get randomness only when the page cache is regenerated and not with every page load. Exclude current post: If selected, when the widget is displayed on a post which matches all other criteria, the post itself will not be displayed as part of the widget. This behavior is useful if you use the widget to direct users to other posts, and displaying a link to the post the user is already on, is a waste of space. Exclude posts which have no thumbnail: If selected, posts without a thumbnail/featured image will not be displayed. 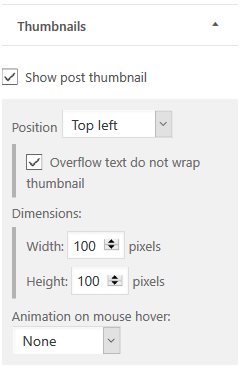 This is useful if you enable the display of thumbnails, and want to avoid style mismatches where some posts are displayed with and some without thumbnails. This is really just a stop gap measure, and it is much better to make sure all relevant posts have featured image. Time for transition: The time it will take to scroll through all of the posts. Number of max. displayed items: The number of posts that will be visible on the screen at any given time. Obviously this should probably be lees the the max number of posts configured in the filter panel. Spacing: How the spacing between the items is calculated. This is a responsive setting and the actual spacing size is dynamically calculated by the browser based on the actual available and used space. None – No spacing by default. If you would like to have any spacing you will need to add appropriate CSS rules. Number of max. displayed items The maximal number of post items that will be visible on the screen at any given time. The actual number varies based on the width of the available area. Obviously this should probably be lees the the max number of posts configured in the filter panel. In this layout post items are arranged in rows. 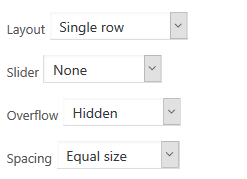 A new row is automatically started when the next item will overflow the available width of the container. This is managed by the browser and adjusted whenever the size of the window changes. Spacing: How the spacing between the items in each rows is calculated. 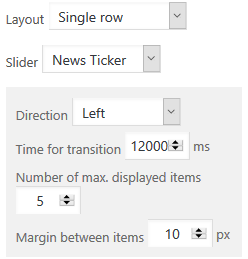 This is a responsive setting and the actual spacing size is dynamically calculated by the browser based on the actual available and used space, but the spacing in one row might not be the same as in another. In this layout post items are organized in a grid (HTML table based). You can set the number of the columns a table has and the number of rows will be automatically decided based on the number of items being displayed. 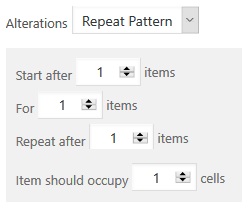 You can use alteration settings to have some items spread over more then one cell. Tables are not responsive. 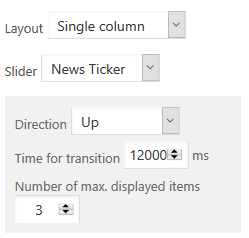 You can get some responsiveness by using a equal distribution of the columns but the responsiveness will have effect only as long as you have some spacing between the columns. 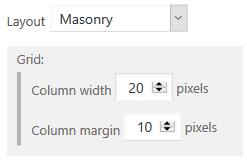 Column width: How to calculate the width for a column. 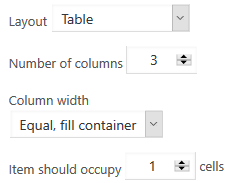 The two options are “Equal Fill container” in which all columns will have the same width in a way which will cover all of the available width, or “content width” in which each column width will be equal to the biggest item in the column and no spacing between them (unless to add relevant rules in your CSS). Column width: This is the spacing between the possible left points of the post items For example, in the settings in the image above, post items can have their left edge either at the left edge of the container, 20*n pixels right to it. It has no impact on the width of the item itself. For example if a 110 pixel wide item will start on the left edge of the container, the next item will start at 120 pixels (20*6) to the right of the edge, and it will also start there if the first item is 105 or 115 pixels wide. Column margin: The minimal horizontal margin between items. With the settings in the image, if a 115 pixel wide item starts on the left edge, the next item will start at 140 pixel right of the edge (the next “ruler” for 115+10 is 20*7=140). Alterations enable you to “spice up” the display by having different style for post items based on their location. When alteration mode is active, you will have additional panel in which you can configure the thumbnail and details setting for the alteration. Last items: In this mode the first n item follow the “normal style, while starting from item n+1 the alteration style is being used. Start after item: Indicates what is the last item to be used for the normal styling. All items till, and including, this one will be styled normally, while all the rest of the items use the alteration styling. Item should occupy: This is a setting for alteration in table layout, and lets you specify how many cells an alteration item should occupy. For: The number of items that will be styled with the alteration style. 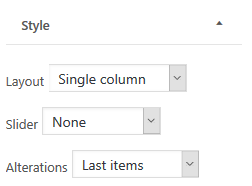 Repeat after: After all the alterations indicated in the “for” parameters were displayed, how many items should be displayed with normal styling before starting alterations again. Here you can control how thumbnails are being displayed. The thumbnails is used to control the display of the thumbnails on the “main” items, while the “Thumbnails alterations” panel (displayed only when alterations are active) is used to control the display of the thumbnails in the alterations. Show post thumbnail: If selected a thumbnail based on the featured image of the post will be displayed. Overflow text do not wrap the thumbnail: This option is available when the thumbnail is aligned and controls how the text to which it is aligned to behaves. When set the text will basically be aligned to the other direction, when not set, if the height of the text is bigger then the height of the thumbnail, the rest of it will wrap around the thumbnail and will be displayed below it. Dimensions (width and height): You should set here The dimension of the thumbnail in pixels. When an image is uploaded, WordPress generates automatically several versions of them in smaller dimensions. The widget will select the one which is closest to the requested dimension and use it. If the match is not exact the browser will be instructed to stretch the image to fit the area. In view of the previous point, you might want to use a plugin, or any any other appropriate tool, to instruct WordPress to generate images in the requested size (and then maybe run any plugin that regenerates them to make sure you have them for older posts as well). The motivation is mostly to avoid using big pictures to save bandwidth. Starting with WordPress version 4.4 images will be responsive. When possible, the widget will give the browser several images instead of one, and the context in which they should be preferred, for example an image for “normal” displays and an higher quality image for retina displays. Darker: The thumbnail image will get a darker tone to it. Brighter: The thumbnail image will get a brighter tone to it. Zoom In: The thumbnail image will be zoomed into. Here You can control what text will appear as part of the post description. The “Post details” panel is used to control the display of the post details on the “main” items, while the “Post details alterations” panel (displayed only when alterations are active) is used to control the display of the post details in the alterations. Justify: The text is spread to align on both sides of the containing area. Disable the built-in CSS for this widget: If selected no CSS will be added automatically to style the specific widget. Any styling will have to be done by adding your own CSS rules. Hide widget if there are no matching posts: If selected, when there are no posts in the category (or none have thumbnail, if the hide posts without thumbnail option is selected), The widget will not be displayed at all, which in practical terms means that the title and footer will not show. Footer link text: If not empty a link to the relevant category page will be displayed in the footer, with the text being used as the anchor text of the link. Footer link URL: When non empty the footer text will be turned into a link. Note: How to combine categories in one link you can be read here.